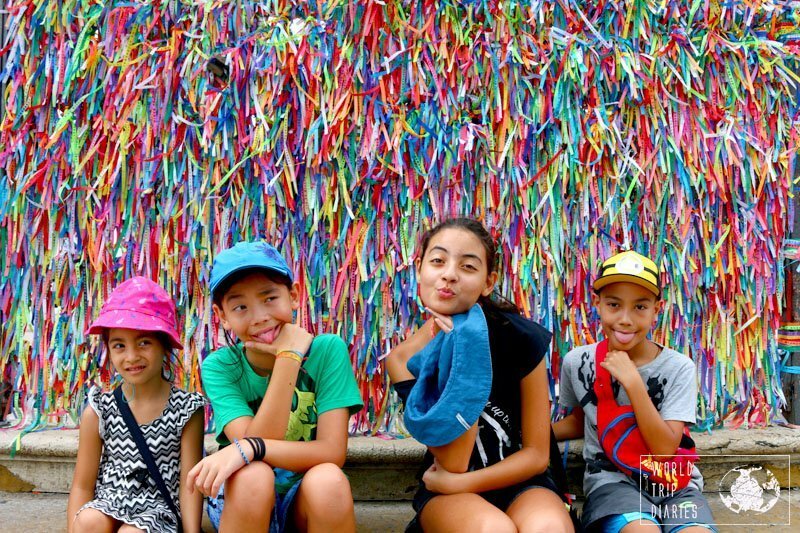 We spent 12 days in Salvador in November 2016. 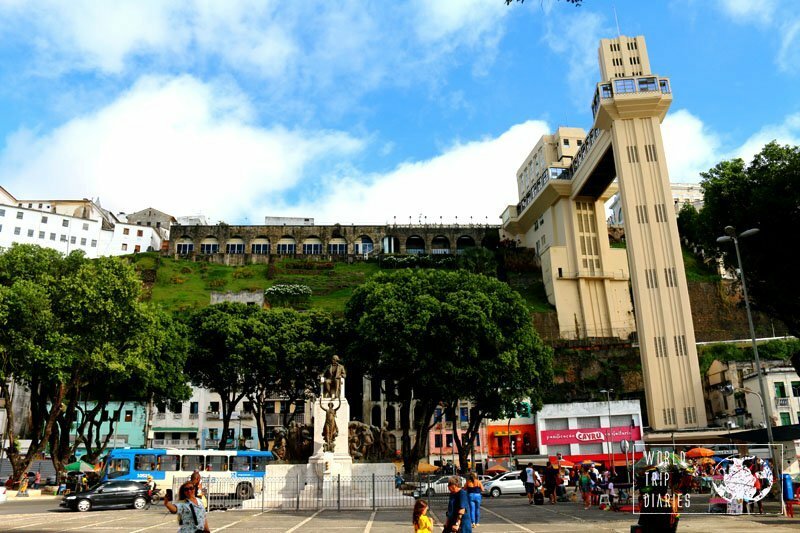 On this post, I’ll talk about Bomfim Church, Elevador Lacerda, Mercado Modelo, Projeto Tamar and Salvador Shopping Mall. This is the second post of the series. You can read part 1 here, about Pelourinho and Praça da Sé. 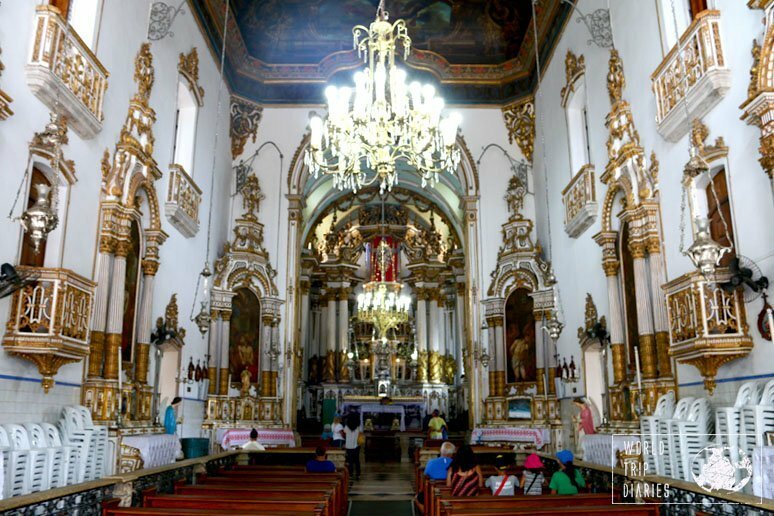 One of the ‘must do’s in Salvador is the Bomfim Church. Of course, we wouldn’t miss it. It’s famous because of its colorful ribbon. They’re said to grant you wishes: 3 wishes per ribbon. You need to make your wishes while someone is tying a knot, and it’s 3 knots. After it breaks (naturally, you can’t just rip it), your wish will (or not, who knows?) come true. Inside Bomfim church. See the kids there? The gates around the church are all filled with the little ribbons, and it’s pretty cheerful. We could see it from inside the car. And then we parked the car, at the square in front of the church. Even before we closed the doors, people came around to sell us the ribbons. We didn’t buy it, but we ended up paying for them to watch our car (aka not scratch it). If we’d parked behind or beside the church, we’d probably not even seen them.We were aggressively offered the ribbons around 3 times until they realized we weren’t buying it. My mom, on the other hand, bought the ribbons, got herself blessed by 2 different dudes and I don’t know what else. When we finally arrived at the gates, we were able to tie our ribbons (that my mom bought, haha) and it was kind of fun. We had to find a spot, tie it while we made wishes. It was a nice ritual and loads of people were there doing the exact same thing. The church itself is beautiful but nothing out of the ordinary. My mom went to say a prayer and the kids went with her. It was empty then but it was nice and ventilated. We left when my mom was done. 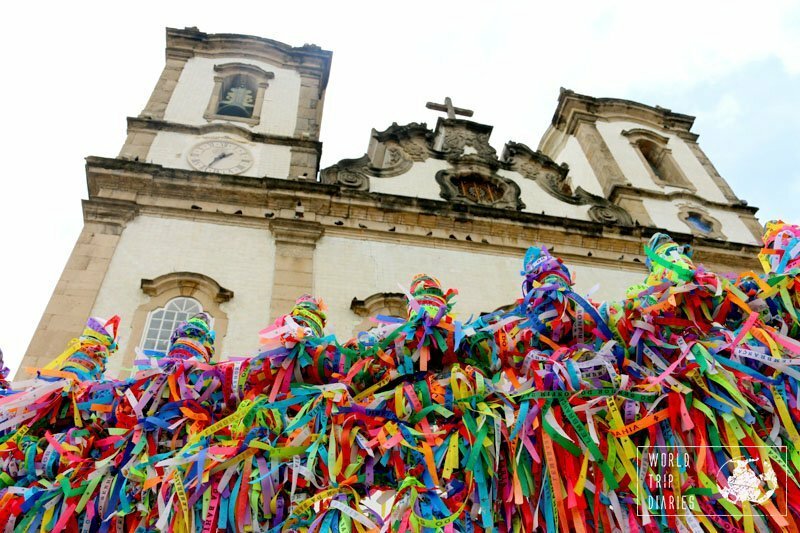 Around the church, there are many stores, and they all sell the Bomfim ribbons, so check them out before buying. We bought 20 for R$ 2. A lot cheaper than the 10 ribbons for R$ 7 the guys at the square were selling. You can usually choose the colors too. 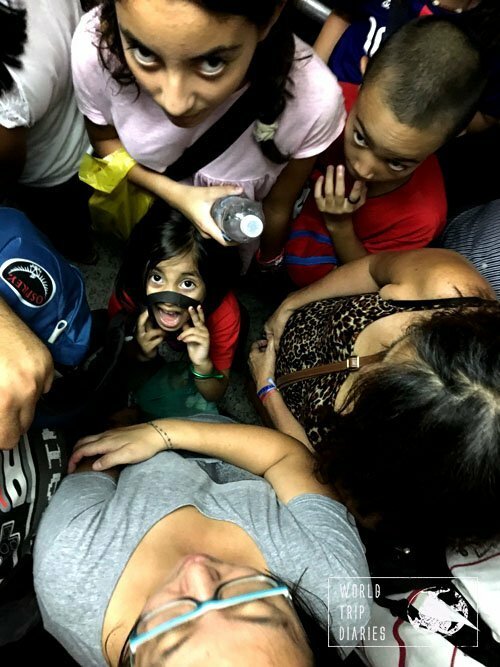 Elevador Lacerda (Lacerda lift) is very busy all day long. We rode it 4 times, and they were all very full. It cost us R$ 0,15 /person each ride. It’s got its fame for being the first lift in the world to be used as public transport. It really saves a lot of time going from the top of the hill to the bottom. The views from the higher part are just amazing at any time of the day. We enjoyed it while having an ice cream or a milkshake from A Cubana. They’re pretty good, possibly the best we’ve had in Brazil. At the bottom, you just cross the road to go to Mercado Modelo, which is kind of a souvenir market. I’ll tell you more about it later in this post. At night, the Lift lights up and turns blue. The ride takes around 30 seconds, but it’s hot and crowded. We went there twice. The first time, we got there around 6:30 pm and it closed at 7. The doors literally close, so you have to leave fast. We missed the closing, so we had to exit from the back door and go all around the market. It might not have been a bad experience had it not been super dark and full of people trying to get you to buy stuff surprising us at every step. The second time we went there, we arrived before lunch. There are many stores that sell souvenir, basically, and it’s pretty fun. 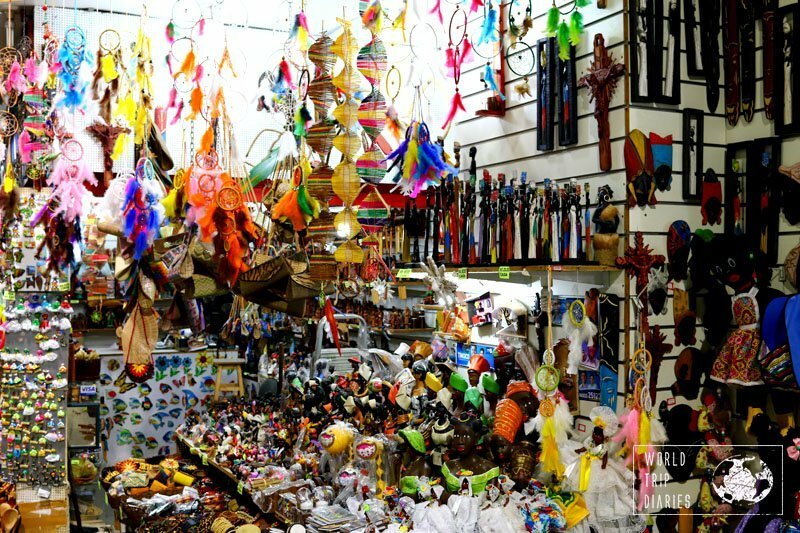 There are clothes, toys, shoes, sculptures, paintings, food, cachaça, accessories, and a lot more. We spent around 3 hours walking around the place. Things are cheaper there, so consider a visit right at the start of your trip. I love sea turtles. Love them. When I was in grad school, my wish was to work with them. Projeto Tamar is an NGO that works with the preservation of Sea Turtles in Brazil. It’s one of the very few opportunities to see sea turtles in the world. They usually care for the turtles and set them free, but there were many of them that seemed to be there for a long time. There were even baby turtles. Praia do Forte Village, so pretty! They’re pretty big and have facilities all over Brazil. This one, in Praia do Forte, is a big one. There are lots of pools for the turtles, touch tanks with stingrays, and even a carpet shark that we get to touch during feeding time (it seems that it doesn’t always happen). At the exit, we saw this lady selling out cocada (Brazilian coconut with sugar sweet) and chilly. It was the BEST cocada we’ve ever had. The chilly was also amazing. It was a fun day out, but my favorite thing was not Projeto Tamar, but Praia do Forte itself. The village is gorgeous, with great restaurants, nice shops, and loads of people everywhere. We had lunch at Paulo Careca, with delicious typical food. Try out the moqueca, which is fish cooked in coconut milk with palm oil. Delish! 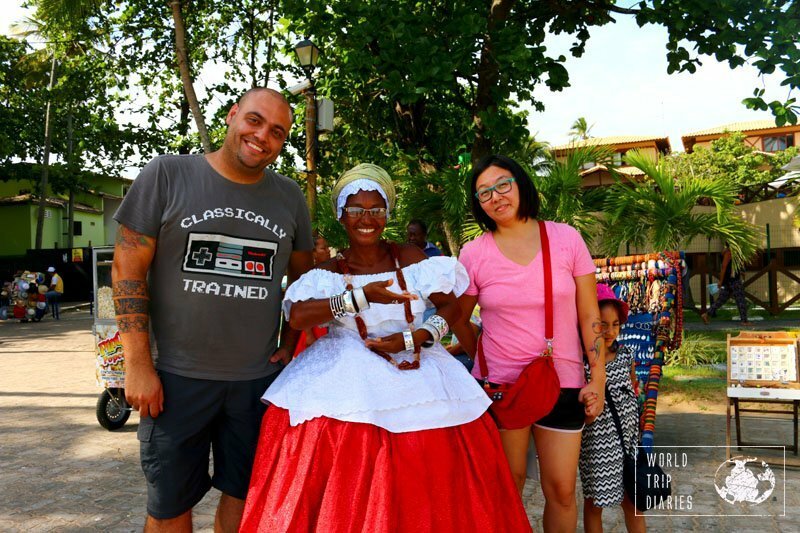 We wandered around, had ice cream, walked on the beach and took a photo with a Bahiana lady (she charged us R$ 20 for the 3 sets of photos we took). In Praia do Forte, there’s also the Projeto Baleia Jubarte (Humpback whale project) that we didn’t visit due to time constraints. 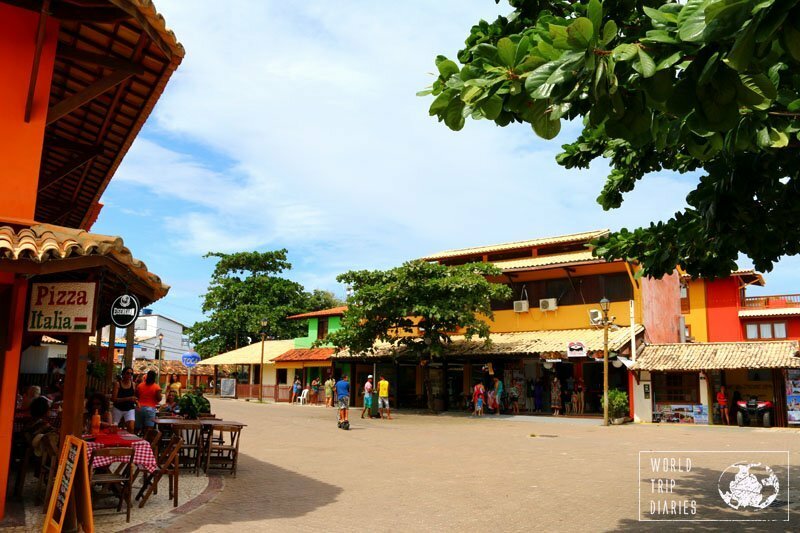 It’s worth a couple of nights’ stay in Praia do Forte. Lastly, we visited Salvador Shopping Mall on our last day – it was rainy and windy, so no beach for that day. It’s a huge shopping mall. We basically went to have lunch and spent around 3 hours there. The food court is one whole floor, and it has so many options we gave up on seeing them all. During our time there, we saw a Ferris wheel and a Santa Parade. The air conditioning was super strong, so we felt really cold there. If you go, take a cardigan. Other than that, it’s a shopping mall, with the same stores as all the others. 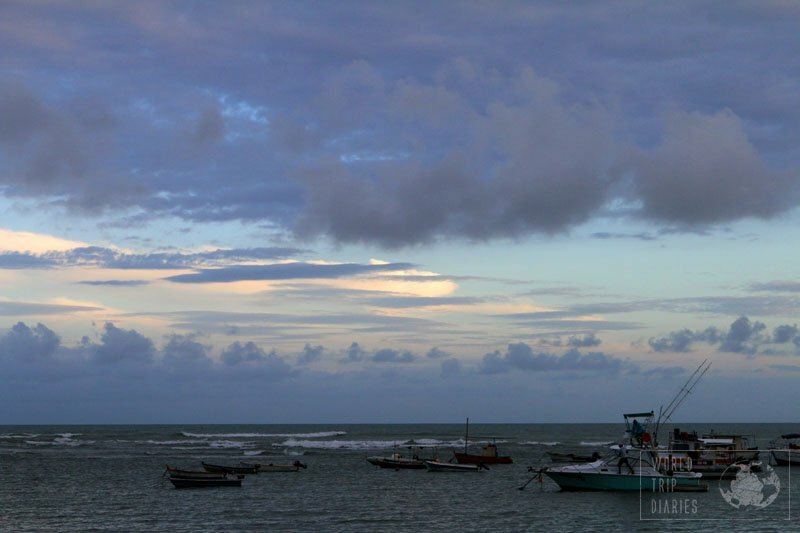 Next Wednesday, we’ll talk about Barra, the place we spent our days in Salvador. Would you like to receive a postcard from us? Just subscribe to our newsletter – we send out 3 postcards a month! Sobre a praia do Forte, vocês entraram na água? É forte? De tombo?